Being able to give back and inspire others is something that I am passionate about. My time at San Jose State has consisted of positive energy and influences that have helped me grow to be confident leader that I am today. From running for Hall Government, to taking on the role of a Resident Advisor, and becoming an Orientation leader, it has all helped shaped me to be the person and leader I am today. 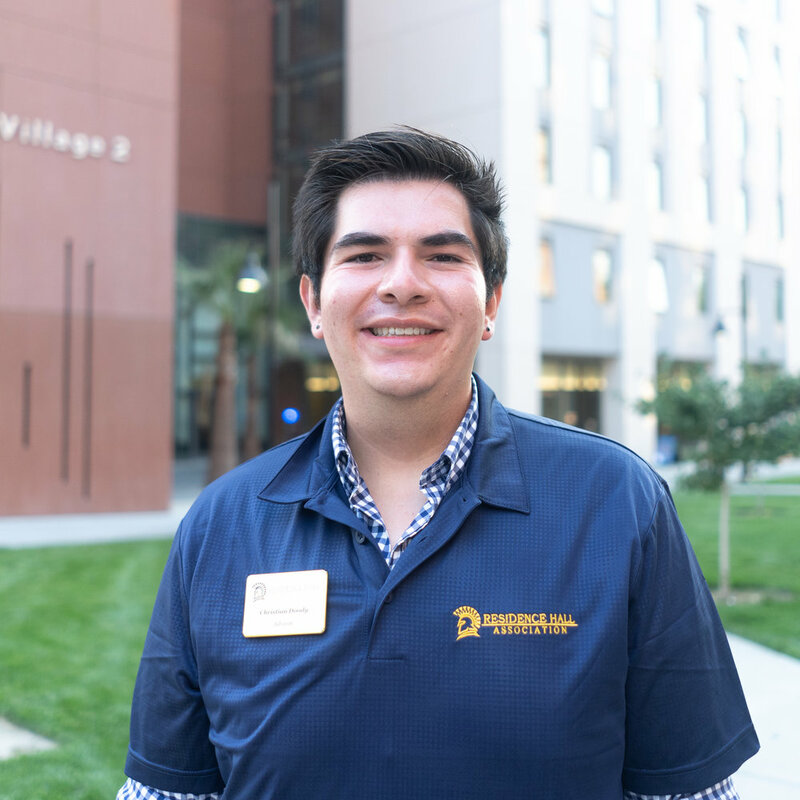 Now, as a 3rd year Computer Science major, I have taken on this role in RHA to keep involving myself and embracing the community and numerous opportunities that San Jose State University has to offer. As President of the Residence Hall Association, I hope to continue to enhance the on-campus experience and help build a stronger community within the residence halls and also provide leadership opportunities for students to begin to find their passions and establish their place on this campus. Fun Fact: I danced for the Warriors Jr Jam Squad when I was a kid! Hello! My name is Yissel and I come from Escondido, CA. I’m a second year biology major with the hopes of becoming a nurse. One of my passions is helping people and being socially active/aware within my community. During my free time, I enjoy being outdoors, working-out, and watching movies. I have a love-hate relationship with the beach. One day I hope to travel to at least seven countries. My worst enemy is time and I hope to attend a concert or music festival this school year! Fun Fact: I have always been wary near animals because when I was a kid, my mom told me that I would get rabies from petting animals, even dogs. Fun Fact: If I ever go missing, you will most likely find me somewhere in San Francisco. I grew up in Hong Kong and San Francisco. I am currently a BFA Graphic Design student. I am passionate about communication and education empowerment. I enjoy utilizing graphics and technology to communicate ideas. In my free time, I enjoy playing the guitar, taking photos and listening to podcast. I like chicken wings and tacos! I hang out at coffee shops and boba shops! Hello everyone! My name is Berlinda. I am a senior Graphic Design major. I came from the island of Taiwan. My country has been influenced by other peoples based on our long history, so I grew up in a place rich with many different cultures. I love this part about my home which is also why I traveled across the Pacific Ocean to this diverse country. In my leisure time, I like to travel and go on photo shoots with my friends. Fun Fact: My mom said luck is stored in the earlobe which is why I don’t have ear piercings. My name is Bradley Brantome and I am serving at RHA's National Communications Coordinator (I send lots of emails and do my best to represent our school at national conferences) for the 2018-2019 academic year. I was born in Hollister, CA and I am still getting used to sidewalks and freeways. I love history, government, and learning all about culture so if you have a fun fact hit me (with the fun fact, nothing else please). I look forward to working with everyone interested in RHA and I hope I can help create an enriching experience for all residents. Fun Fact: I am growing oranges in my room. They're not ready yet so don't ask for one. I am very excited in this second year at SJSU to be working with amazing student leaders and supporting our residential communities. I am very passionate about advocating for students needs and making sure that their voices are heard throughout the university. I love working with students on a daily basis and especially enjoy working with students through various leadership opportunities. As a Residential Life Coordinator, I feel this is the perfect opportunity to support students and help them to develop into future professionals and leaders. Fun Fact: I can play five instruments!